In order to solve the problem of photon attenuation, one needs to know the attenuation coefficient or attenuation map for the individual patient being studied. Techniques have been developed to correct the attenuation and scattering in SPECT for single-energy photon emitters such as 99m Tc and multienergy emitters such as 201 Tl where there is no spillover in the transmission window due to overlapping of the emission and transmission windows. However, these techniques are not satisfactory for generating the patient-specific attenuation maps in the case of a multi-energy emitter such as 67 Ga, in which the emitted photon energy window overlaps with the transmission window for 153 Gd in addition to the downscatter. 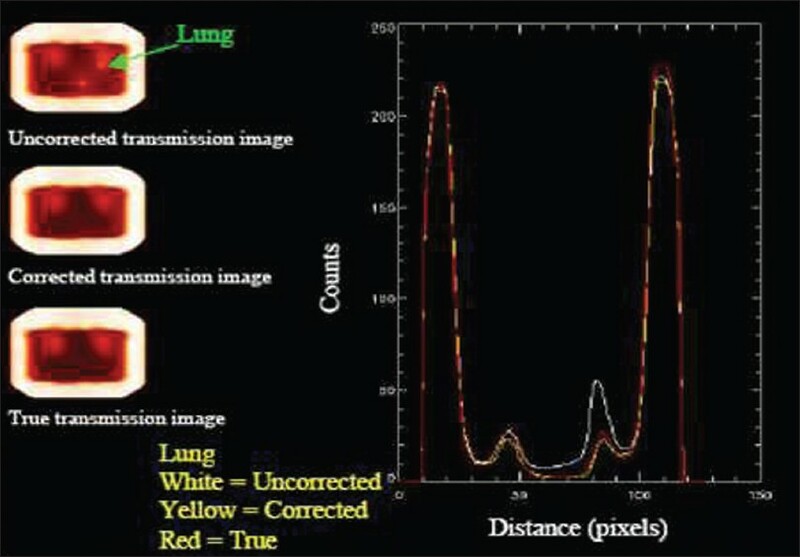 Owing to the strong influence of the downscatter and the spillover in transmission map during simultaneous emission and transmission tomography, it is necessary to correct the transmission map before reconstruction of the emission images. It is therefore desirable to develop a correction method to produce a corrected attenuation map that can be used for attenuation correction in the emission reconstruction. In the present study, we made an attempt to correct the attenuation map in simultaneous transmission/emission tomography with 153 Gd/ 67 Ga radioisotopes using maximum likelihood method using the expectation maximization (ML-EM) algorithm. For the proposed study, we used the ML-EM algorithm.­ , There are two steps in this method: (1) E-step, which computes the expected projection data for the current estimate and is equivalent to a forward projection, and (2) M-step, in which the expected value is compared to the measured projection data and then the estimated reconstructed image is updated by effectively backprojecting the ratio of the measured to estimated projections. In the algorithm, geometric response, attenuation, and scatter can be accounted for and modeled. Thus, it gives a quantitatively more accurate reconstruction. Attenuation of emitted radiation as it passes through the subject under study is accounted using transmission source and an attenuation map is obtained for image reconstruction. Attenuation map was estimated based on measurements of attenuation in a phantom. We developed a method to correct the transmission window for both the spillover and downscatter. We used three windows, two for emission, i.e. 67 Ga (93 and 184 keV), and one for transmission, i.e. 153 Gd (100 keV). Multiple energy window scatter estimation was not carried out due to constraint in the available acquisition system (Philips/ADAC). Therefore, convolution subtraction was investigated. The available system for transmission measurement consisted of two 153 Gd line sources in a dual head 90° configuration. In order to minimize the depth dependence of resolution, attenuation, spillover fraction and downscatter, the Geometric Mean (GM) of conjugate views was considered. where g o is the observed transmission image, g t is the transmission image without contamination, g l is the lower energy window image, f t is the spillover fraction and g ut is the downscatter image in transmission window. 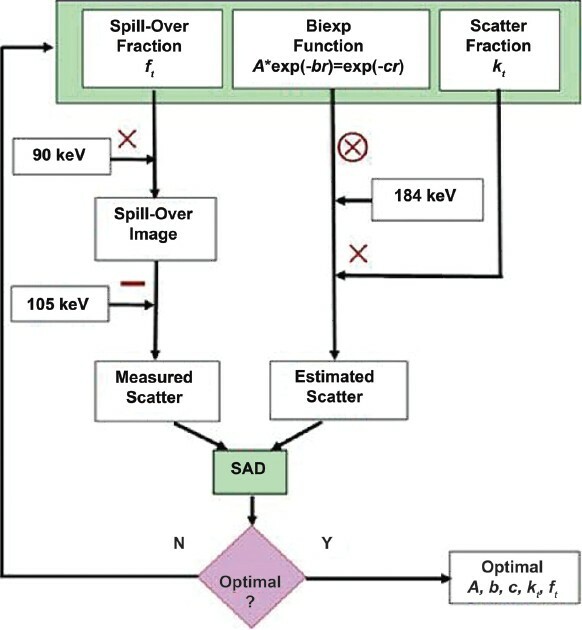 The measurements of the spillover fraction were performed using the ADAC Vertex gamma camera. A point source having 130 MBq of 67 Ga in a 5-ml syringe was placed in air at 15 cm from the face of the detector. A medium energy collimator was fitted to the gamma camera and images were acquired using a 128 × 128 matrix for 84 seconds. This duration was chosen so that it could accumulate 6 million counts in air to see the spillover fraction in the transmission window. Spillover fraction was determined by varying the energy window setting of the lower energy window of 67 Ga as shown in [Table 1]. This was done by shifting the lower energy window of 67 Ga and transmission window (no 153 Gd present) from their estimated photopeak energy windows, i.e. 90 (14%) and 105 (15%). The counts in the emission and transmission windows were noted. The experimental setup is shown in [Figure 1]. As a first approximation, the lower energy window was used to estimate the spillover fraction in air in the transmission window. Multiplying the lower energy emission image with the spillover fraction (f t) derives a spillover image and it was subtracted from the transmission image. The upper energy window was used to estimate the downscatter (g ut) in the transmission window by convolving the upper energy emission image using bi-exponential function. rather than the monoexponential function used for photopeak scatter correction  . where r is radial distance, A, b and c are the parameters for scatter function, and N preserves total counts by normalizing S to unity. where A1 , B, and β are constants and μd is attenuation path length. The correlation between measured k t values and those predicted from the buildup equation was high (r = 0.976). 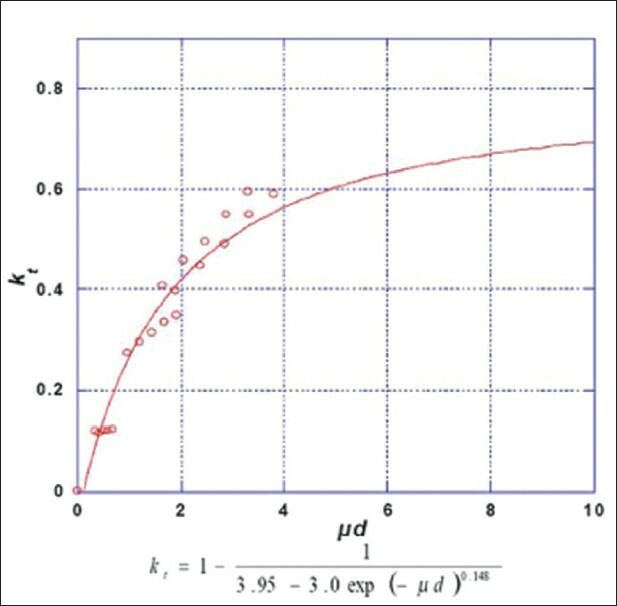 The chi-squared values obtained during curve fitting reduced from 0.034 to 0.031 for the data obtained with non-fixed versus fixed scatter function parameters. It was evident from the observations that f t had a linear relationship with source depth, which differed significantly for the different materials. The variation of individual values from the best fitted line was reduced when the scatter function parameters were fixed. 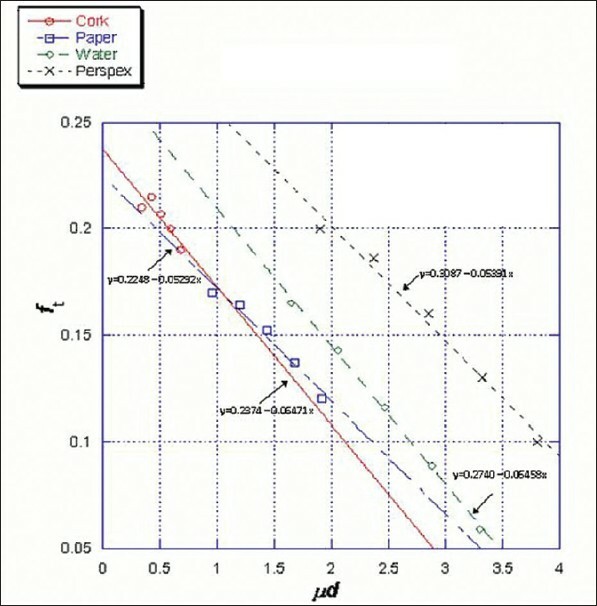 The pattern of linear slope was similar for different materials [Figure 3]. In an attempt to further improve the f t data, another optimization was performed using fixed values for A, b, c, while k t values were obtained from the fitted curve [Figure 4]. The results for k t suggest that externally measured transmission data can be used to estimate the scatter fraction pixel by pixel. However, it is not possible to distinguish depth from material using an external transmission measurement. 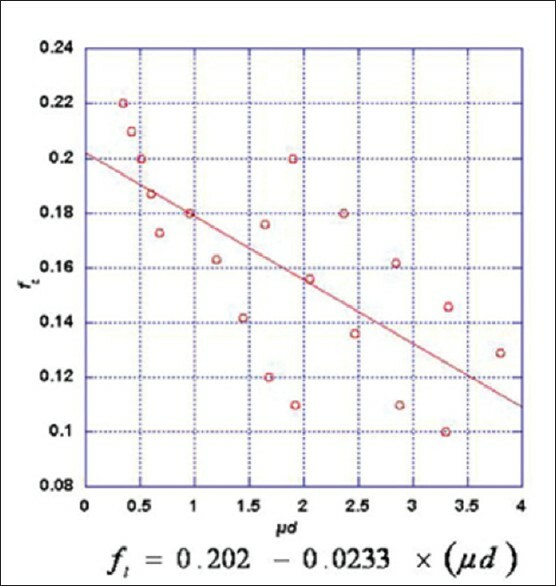 Therefore, a single linear equation (a' + b' * μd) was used to fit the f t data with moderate success (r = 0.70) as shown in [Figure 5]. The fitted values of f t and kt are given in [Table 4]. where T is the total thickness of the object. In most cases, B is set to (A΄ − 1), which results in k t = 0 in air, outside the attenuating object, where e -μT/2 = 1. These values of f t and k t were used when applying the convolution subtraction method in the phantom study. In air, scattered photons are not present in the beam; therefore, spillover fraction in the transmission window due to 90 keV would be expected to remain constant. However, in a medium where high-energy photons of 67 Ga interact by Compton scattering, there is loss of energy and some photons are detected in the transmission window (105 keV) as well as in the lower energy window (90 keV). Scattering depends on the density of the materials; therefore, downscatter also increases with the density and thickness of the object. The scatter due to the 93 keV photon (i.e. photopeak scatter) also increases with thickness and density of material. As a result, the ratio of counts (spillover) for the 105 keV to 90 keV windows is a complex mixture of unscattered and scattered photons. Consequently, the spillover can no longer be considered constant. The spillover fraction in the transmission window (g t) is estimated by the spillover fraction f t multiplied by the lower energy window (g l) of 67 Ga. To account for regional differences in scattering material, f t is replaced by the pixel by pixel spillover fraction F t .
Solution of this equation is only possible by an iterative process since F t and K t are functions of path length as estimated by transmission measurement. The method was validated for 67 Ga/ 153 Gd emission-transmission tomography by variable density (anthropomorphic thorax) phantom using various parameters for scatter function (S), scatter fraction (k t ), spillover fraction (f t ) and spatial window width (SWT ) 13% (13% of the field of view is exposed by the transmission window at any time) for a more realistic situation. Measurements were performed on a Vertex gamma camera (Philips dual head) with the medium energy collimator. A reference scan was acquired before the phantom study. The reference scan consists of two static images that are used to calculate the μT. These images represent the blank scans (zero attenuation). The detectors were positioned in a 90° position. 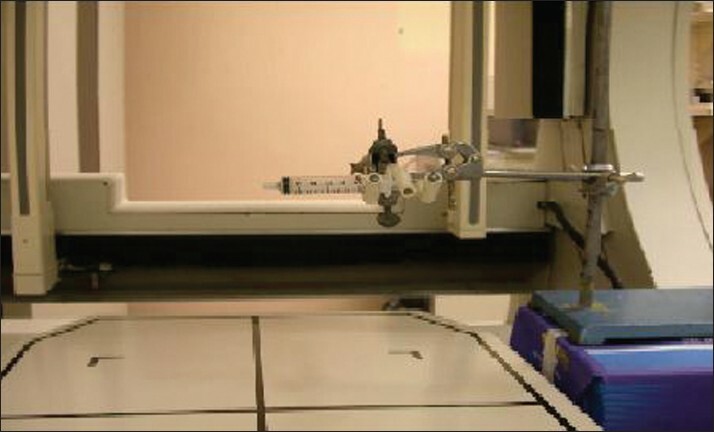 The imaging table was removed and the line source of 153 Gd was used to acquire the reference scan in air using 105 keV (15% window width) with a 128 × 128 matrix size. A true transmission scan was acquired using 128 × 128 matrix size for three photopeak energy windows with centerlines and widths of 90 keV (14%), 105 keV (15%) and 184 keV (20%) to compare with the corrected transmission scan. Simultaneous emission and transmission scans were performed using the 67 Ga/ 153 Gd. The matrix size and window settings were kept same to acquire the true transmission map, uncorrected transmission map and emission image of thorax phantom. Two syringes (20 ml) having 50 MBq and 110 MBq of 67 Ga in 15 ml solution were placed in the lung and liver of the phantom, respectively. The aim of using thorax phantom was to assess the transmission-based correction method in a more realistic imaging situation. 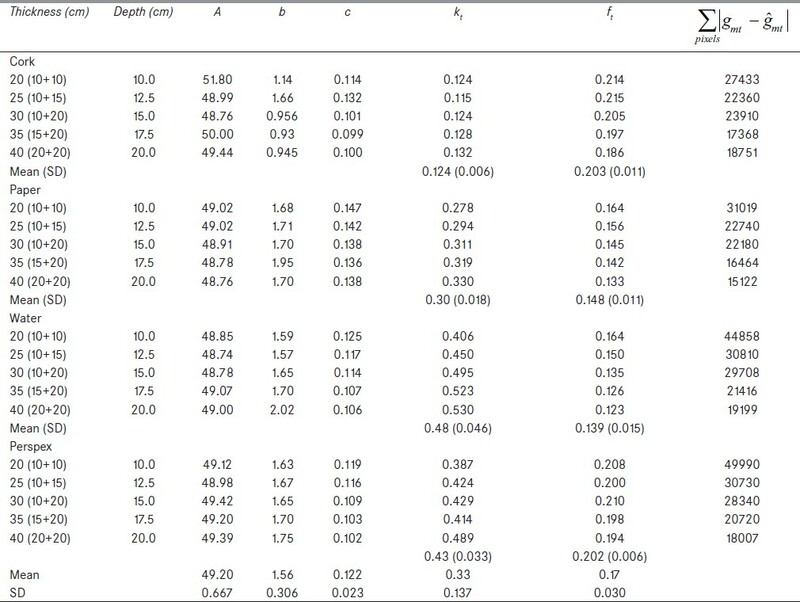 The results obtained are shown in [Table 5], and [Figure 6] and [Figure 7]. The results were assessed by defining two ROIs (region of interests) over the contaminated region of lung and liver in the uncorrected transmission scan. 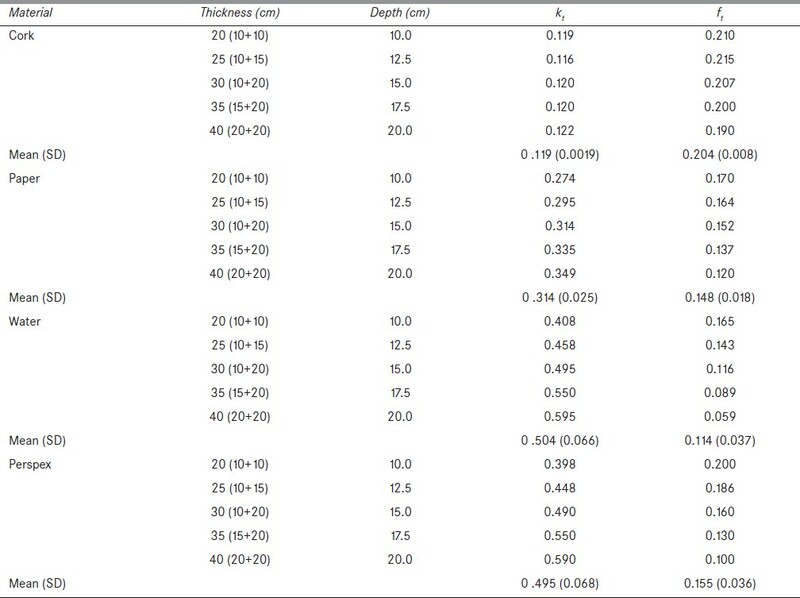 These ROIs were applied to the uncorrected, corrected and the true transmission scans and the mean counts were recorded [Table 5]. It was observed from the mean counts that where no spillover and downscatter correction was applied in the transmission scan (uncorrected) of liver and lung, the mean counts were 19.29 and 26.90, respectively. After applying the transmission-based spillover and downscatter corrections, the mean counts were reduced to 3.80 and 15.10 in liver and lung, respectively. These mean counts were close to mean counts of liver 2.15 and lung 14.89 of the true transmission scans. Therefore, using the transmission-based correction methods for spillover and downscatter in the uncorrected transmission scan, the quantitative error was reduced by 90.0% and 98.2% in liver and lung regions, respectively. The results were also evaluated by examining the count profiles through lungs and liver of the uncorrected, corrected and true transmission scans as shown in [Figure 6] and [Figure 7]. Before the correction, there was significant difference between the profiles of both liver and lungs of uncorrected and true transmission scans. After performing the transmission-based downscatter and spillover corrections, the profiles through the liver and lungs of the corrected transmission scan and true transmission scan showed excellent agreement. The results for the thorax phantom demonstrated the importance of using transmission data for accurate downscatter and spillover correction in the transmission window. The average downscatter and spillover fractions varied considerably from subject to subject and were difficult to correct without transmission data. Furthermore, it is inappropriate to use a constant spillover fraction and downscatter fraction when the object has non-uniform density. The relationship between μd, f t and k t for this combination of radionuclides (67Ga/153Gd) can be established and used to implement transmission-based spillover and downscatter correction, which takes into account the effect of variable tissue density and the object thickness on the spillover and downscatter distribution. In the proposed new method, we introduced the set of F t (spillover) and K t (downscatter) to account for the variations in projection pixels (f t and k t) with the density and thickness of the objects. The Ft and Kt were determined using the transmission data by an iterative process. The quantitative error was reduced by 98.0% for lung and 90.0% for liver in thorax phantom when the corrected transmission images were obtained after the subtraction of spillover and downscatter fractions from the contaminated transmission images. It is therefore concluded that the quantitative error in the contaminated transmission image can be considerably reduced using the proposed transmission-based scatter correction method. 1. Buvat I, Benali H, Todd-Pokropek A, di Paola R. Scatter correction in scintigraphy: The state of the art. Eur J Nucl Med 1994;21:675-94. 2. Ducote JL, Molloi S. Scatter correction in digital mammography based on image deconvolution. Phys Med Biol 2010;55:1295-309. 3. Fakhri el G, Buvat I, Pelegrini M, Benali H, Almeida P, Bendriem B, et al. Respective roles of scatter, attenuation, and depth-dependent collimator response and finite spatial resolution in cardiac single-photon emission tomography quantitation: A Monte Carlo study. Eur J Nucl Med 1999;26:437-46. 4. de Vries, King MA, Soares EJ, Tsui BM, Metz CE. 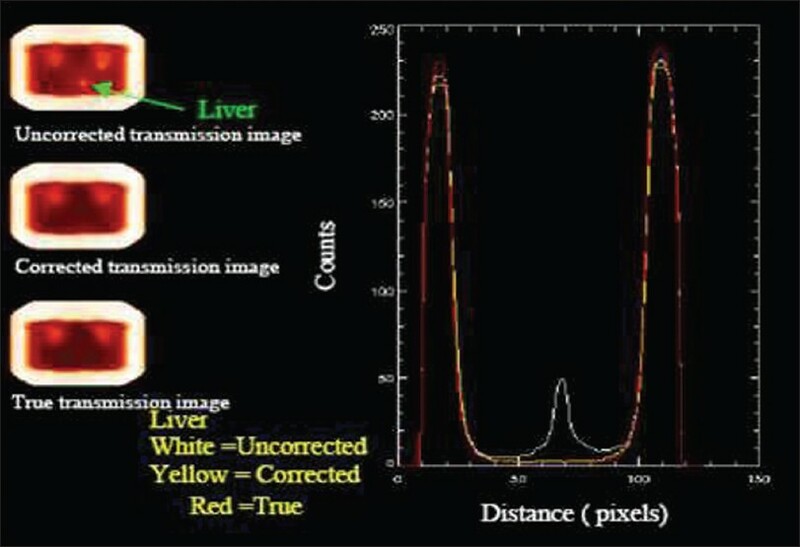 Evaluation of the effect of scatter correction on lesion detection in hepatic SPECT imaging. IEEE Trans Nuc Sci 1997;44:1733-40. 5. Farncombe TH, Gifford HC, Narayan MV, Pretorious PH, Bruyant P, Gennert M, et al. An optimisation of reconstruction into the impact of photon scatter in 67Ga SPECT. IEEE Trans Nucl Sci 2002;49:2148-54. 6. Hwang D, Zeng GL. A new simple iterative reconstruction algorithm for SPECT transmission measurement. Med Phys 2005;32:2312-9. 7. Lange K, Carson R. EM reconstruction algorithms for emission and transmission tomography. J Comput Assist Tomogr 1984;8:306-16. 8. Shepp LA, Vardi Y. Maximum likelihood reconstruction for emission tomography. IEEE Trans Med Imag 1982;MI-1:113-22. 9. Hutton BF, Jayasinghe MA, Bailey DL. 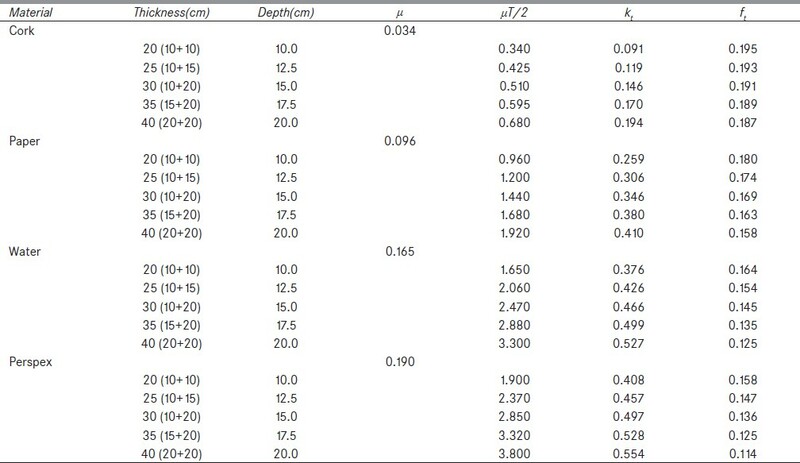 Artifact reduction dual radionuclide subtraction studies. Phys Med Biol 1987;32:477-93. 10. Axelsson B, Msaki P, Israelsson A. Subtraction of Compton-scattered photons in single-photon emission computerized tomography. J Nucl Med 1984;25:490-4. 11. Meikle SR, Hutton BF, Bailey DL. A transmission-dependent method for scatter correction in SPECT. J Nucl Med 1994;35:360-7. 12. Larson SA. Gamma camera emission tomography. Acta Radiologica 1980;Suppl 363:1-75. 13. Meikle SR, Hutton BF, Bailey DL, Fulton RR, Schindhelm K. SPECT scatter correction in non-homogeneous media. Information Processing in Medical Imaging, 12 th International Conference. Berlin: Springer-Verlag; 1991. p. 34-44.